View the product demo video here. Gauge is the measurement for the thickness of metals. It is the same for wire as it is for sheet. 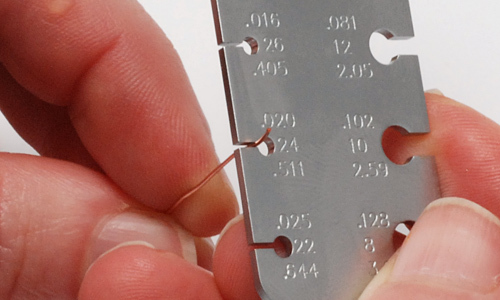 Using a wire gauge is an excellent way to determine the thickness of a piece of wire or metal. Remember the higher the number the thinner the sheet or wire. 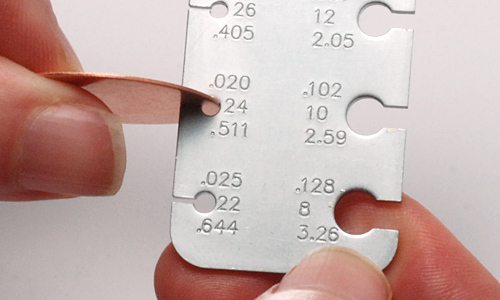 The wire gauge shows the measurements in three different ways; inches, gauge and millimeters. Typically metals purchased in the U.S. are noted in gauge and those purchased in Europe are noted in millimeters. By using the wire gauge, you will be able to figure the thickness regardless of the type of measurement notation used. The gauge has a small slit in the side that equals the thickness of the metal. The hole at the end of the slit allows for free movement of the metal and has nothing to do with the measurement. The correct size will fit the wire snugly. If there is any extra space, try the next smaller size. Dead Soft Wire or Sheet has not been work-hardened and therefore is soft and easy to manipulate while fabricating or wire working. Wire and sheet stiffens when used, so most designs and wire wrapping are best done with dead soft material and will work harden when used. Pieces may be further work-hardened by hammering or tumbling. Half Hard Wire or Sheet is work-hardened to stiffen. Half hard is usually used when wire working and making loops or shapes that need to retain their shape without hammering or tumbling. If your sheet or wire becomes too work-hardened it may be annealed to soften and return it to a working temper. Click here for our FREE Annealing Metal Online Class. Take a look at the blank that is inserted in the gauge. The center number is “24”. That is the gauge. The number on top is .020. That is the thickness in inches. The number on the bottom is “.551” That is the thickness in millimeters. We have tilted the gauge to show the wire inserted into the slit. Again you can tell that the wire is 24 gauge, the same thickness as the blank pictured above.